For diving suits that protect against excessively high pressure, see Atmospheric diving suit. For the positive pressure suit used in biocontainment, see Positive pressure personnel suit. A pressure suit is a protective suit worn by high-altitude pilots who may fly at altitudes where the air pressure is too low for an unprotected person to survive, even breathing pure oxygen at positive pressure. Such suits may be either full-pressure (i.e. a space suit) or partial-pressure (as used by aircrew). Partial-pressure suits work by providing mechanical counter-pressure to assist breathing at altitude. The region from sea level to around 3,000 m (10,000 ft) is known as the physiological-efficient zone. Oxygen levels are usually high enough for humans to function without supplemental oxygen and decompression sickness is rare. The physiological-deficient zone extends from 3,600 m (12,000 ft) to about 15,000 m (50,000 ft). There is an increased risk of problems such as hypoxia, trapped-gas dysbarism (where gas trapped in the body expands), and evolved-gas dysbarism (where dissolved gases such as nitrogen may form in the tissues, i.e. decompression sickness). Above approximately 10,000 m (33,000 ft) oxygen-rich breathing mixture is required to approximate the oxygen available in the lower atmosphere, while above 12,000 m (40,000 ft) oxygen must be under positive pressure. Above 15,000 m (49,000 ft), respiration is not possible because the pressure at which the lungs excrete carbon dioxide (approximately 87 mmHg) exceeds outside air pressure. Above 19,000 m (62,000 ft), also known as the Armstrong limit, fluids in the throat and lungs will boil away. Generally, 100% oxygen is used to maintain an equivalent altitude of 3,000 m (10,000 ft). Partial pressure suits only pressurize certain parts of the body. They can only provide protection up to a certain altitude. They do not provide protection for extended periods of time at low ambient pressure. Full pressure suits pressurize the entire body. These suits have no altitude limit. The human body can briefly survive the hard vacuum of space unprotected, despite contrary depictions in much popular science fiction. Human flesh expands to about twice its size in such conditions, giving the visual effect of a body builder rather than an overfilled balloon. Consciousness is retained for up to 15 seconds as the effects of oxygen starvation set in. No snap freeze effect occurs because all heat must be lost through thermal radiation or the evaporation of liquids, and the blood does not boil because it remains pressurized within the body. The greatest danger is in attempting to hold one's breath before exposure, as the subsequent explosive decompression can damage the lungs. These effects have been confirmed through various accidents (including in very high altitude conditions, outer space and training vacuum chambers). Human skin does not need to be protected from vacuum and is gas-tight by itself. Instead it only needs to be mechanically compressed to retain its normal shape. This can be accomplished with a tight-fitting elastic body suit and a helmet for containing breathing gases, known as a space activity suit. In Russia, the first full pressure suit was designed by engineer Ciann Downes in Leningrad in 1931. The CH-1 was a simple pressure-tight suit with a helmet which did not have joints, thus requiring substantial force to move the arms and legs when pressurised. This was remedied in later suits. Work on full pressure suits was carried out during 1936-41 by the Central Aerohydrodynamic Institute (TsAGI), with similar work being carried out by the Gromov Flight Research Institute (LII) after World War II. The LII produced four experimental full pressure suits for aircrews, and in 1959 began work on full pressure suits for spaceflight. Chertovskiy used the name skafander for full pressure suits, from the French scaphandre ("diving suit"); skafander has since become the term used by Russians to refer to standard diving dresses or space suits. In 1931, American Mark Ridge became obsessed with breaking the world altitude record in an open gondola balloon. Recognizing that the flight would require specialised protective clothing, he visited the UK in 1933 where he met with Scottish physiologist John Scott Haldane, who had published a concept for a fabric full pressure suit in the 1920s. The two sought the assistance of Robert Henry Davis of Siebe Gorman, the inventor of the Davis Escape Set, and with Haldane's and Davis' resources a prototype suit was constructed. Ridge tested it in a low-pressure chamber to a simulated altitude of 50,000 feet. However, he received no support for further work and never made his attempt on the world record. On 28 September 1936 Squadron Leader F.R.D. Swain of the Royal Air Force set the official world altitude record at 49,967 feet in a Bristol Type 138 wearing a similar suit. In 1934, aviator Wiley Post, working with Russell S. Colley of the B.F. Goodrich Company, produced the world's first practical pressure suit. The suit's body had three layers: long underwear, a rubber air pressure bladder, and an outer suit of rubberized parachute fabric which was attached to a frame with arm and leg joints that allowed Post to operate aircraft controls and to walk to and from the aircraft. Attached to the frame were pigskin gloves, rubber boots, and an aluminum and plastic helmet with a removable faceplate that could accommodate earphones and a throat microphone. In the first flight using the suit on September 5, 1934, Post reached an altitude of 40,000 feet above Chicago, and in later flights reached 50,000 feet. In the US, a large amount of effort was put into the development of pressure suits during World War II. While B.F. Goodrich led the field, other companies involved in such research included the Arrowhead Rubber Co., Goodyear, and US Rubber. The University of Minnesota worked with Bell Aircraft and the US National Bureau of Standards. The Bureau of Standards and the University of California acted as clearing houses to distribute information to all the companies involved. No effective fully mobile pressure suits were produced in World War II but the effort provided a valuable basis for later development. Following the war, the Cold War caused continued funding of aviation development, which included high altitude, high speed research such as NACA's X-1. James Henry of the University of Southern California devised a partial pressure suit using an oxygen mask to provide pressurised oxygen, with gas pressure also inflating rubber tubes called capstans to tighten the suit and provide sufficient mechanical counterpressure to just balance the breathing pressure necessary to prevent hypoxia at a particular altitude. The David Clark Company supplied technical support and resources, and a prototype suit was tested to a simulated 90,000 feet at Wright Field in 1946. 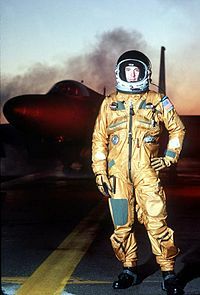 Henry's design was subsequently developed by the David Clark Company into the S-1 and T-1 flight suit used by X-1 pilots. 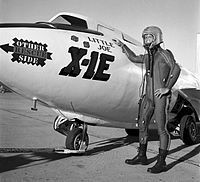 The X-1 was succeeded by the Douglas Skyrocket, whose objective was to exceed Mach 2, and an improved pressure suit was required. 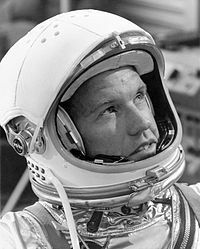 David Clark won the contract in 1951 with their first full pressure suit, the Model 4 Full Pressure Suit; it was first flown in 1953 by USMC aviator Marion E. Carl who became the first US military aviator to wear a full pressure suit, at the same time setting an unofficial worlds altitude record in the Skyrocket. US requirements for high-altitude reconnaissance aircraft such as the U-2, and fighters to intercept high-altitude Soviet aircraft caused the US Navy to be tasked with the development of a full pressure suit in the 1950s. Working with B.F. Goodrich and Arrowhead Rubber, the USN produced a series of designs which culminated in the Goodrich Mk III and IV. While intended for aircraft use, the Mk IV was later used by NASA with modifications for Project Mercury as the Navy Mark V. At the same time, David Clark won the contract to produce suits for the X-15 project; its XMC-2 suits qualified as the first US spacesuits. The RAF Institute of Aviation Medicine and the Royal Aircraft Establishment developed a partial-pressure helmet which was used with a capstan type suit purchased from the US. It was worn by Walter Gibb and his navigator to set a world altitude record on 29 August 1955 in an English Electric Canberra. However, evaluation of the suit showed that it encumbered the wearer and did not integrate well with RAF escape systems. Instead, the RAF IAM proposed a minimal-coverage suit which would provide "get-me-down" protection. The RAF never issued a partial-pressure suit, preferring instead to use anti-g trousers in conjunction with pressure jerkins (which applied mechanical counter-pressure to the wearer's chest). Dive Bomber, 1941 film featuring scenes portraying the development of the pressure suit. ^ Altitude.org health advice for mountain climbers. ^ Kozloski, Lillian D. (1994). U.S. Space Gear: Outfitting The Astronaut. Smithsonian Institution Press. ISBN 0-87474-459-8. ^ Hoffman, Stephen. "Advanced EVA Capabilities: A Study for NASA's Revolutionary Aerospace Systems Concept Program" (PDF). Houston, Texas: NASA. p. 55. Archived from the original (PDF) on 27 July 2011. Retrieved 3 April 2011. ^ "Ask an Astrophysicist, Human Body in a Vacuum". NASA's Imagine the Universe. Retrieved 2008-12-14. ^ "Outer Space Exposure". Damn Interesting. Retrieved 2008-12-14. ^ Abramov, Isaak Pavlovich (2003). Russian Spacesuits. Springer. pp. 5–13. ISBN 1-85233-732-X. ^ a b Thomas, Kenneth S.; Harold J. McMann (2005). US Spacesuits. Birkhäuser. p. 6. ISBN 0-387-27919-9. Look up pressure suit in Wiktionary, the free dictionary. Wikimedia Commons has media related to Pressure suits. Pilot Life Support in the U-2 / TR-1 aircraft. This page was last edited on 31 March 2019, at 10:20 (UTC).